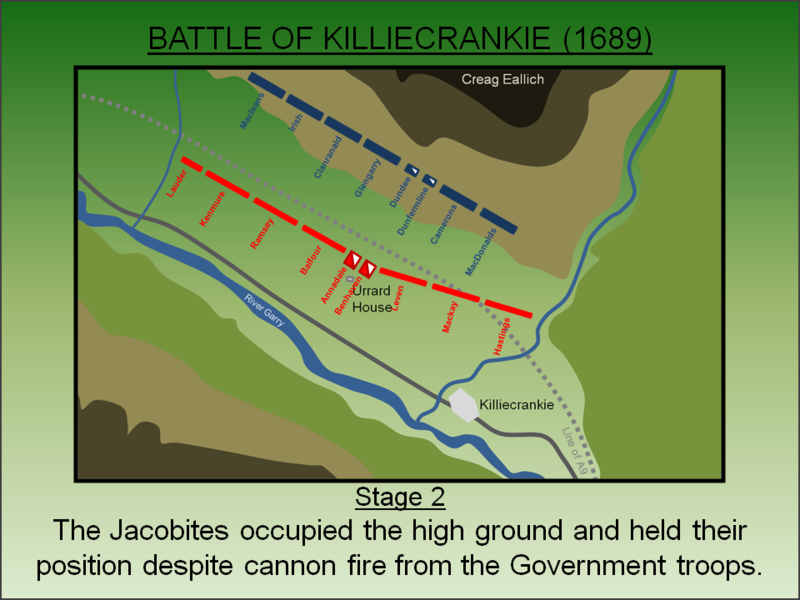 The Battle of Killiecrankie was fought on the 27 July 1689 and was the first major engagement in the Jacobite rebellions. 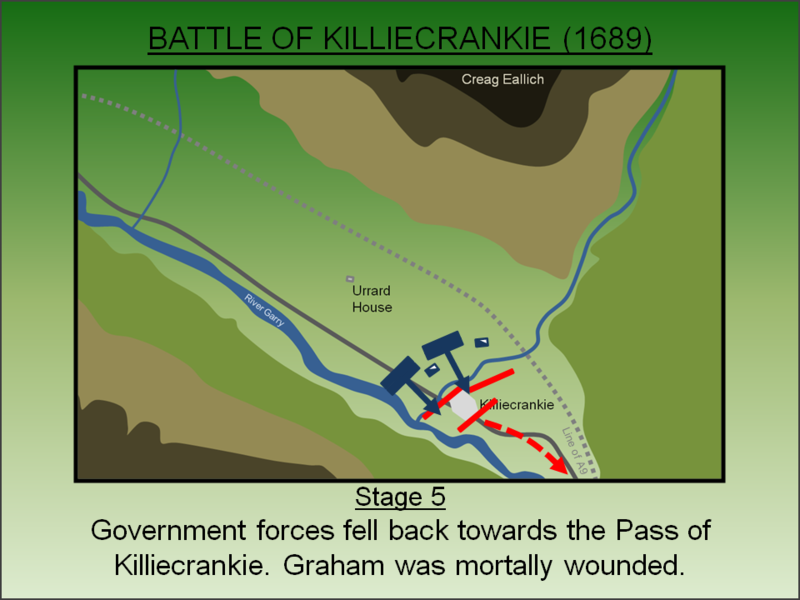 A Government army was lured through the narrow, two mile long Pass of Killiecrankie where they were attacked and defeated by a combined force of Highlanders and Irishmen under the command of James Graham of Claverhouse. During the mid-seventeenth century, the British Isles had been engulfed in a series of internal conflicts now collectively known as the Wars of Three Kingdoms. Religion was a significant factor with both Scottish and English factions strongly opposed to Catholicism or even any of its 'high church' principles. The wars had ended with the Restoration of Charles II in 1660 but, when he died without a legitimate heir, he was followed by his overtly Catholic brother, James VII (II of England). With both England and Scotland still war weary - the earlier conflicts had led to the death of a greater percentage of the populace than World War I would claim in the twentieth century - James was initially accepted. Those opposed to his Catholic leanings acknowledged that his only two children - Mary and Anne - were both married to Protestant husbands who would likely succeed him. However in June 1688 his wife, Queen Mary, gave birth to a male heir, James Francis Edward Stuart. Now faced with an enduring Catholic dynasty, a number of senior English magnates invited William, Prince of Orange to invade and take the throne. He was the nephew of the King and was also married to his eldest daughter, Mary Stuart. William landed with his army on 5 November 1688 at Brixham which started a popular uprising against King James that resulted in his overthrow. Known as the Glorious Revolution, William and his wife became joint monarchs subject to constitutional limitations. However, whilst Protestant England embraced the new rulers, reaction in the northern Kingdom was mixed. The Scottish Convention (Parliament) had unanimously supported William and Mary but only after one its members - James Graham of Claverhouse, Viscount Dundee - had stormed out and refused all summons to return. Across the wider country there was reluctance, amongst both Protestant and Catholic circles, to displace the Stuart dynasty which had ruled Scotland for over 300 years. Furthermore James VII had not been killed as part of the revolution - he had simply fled abroad (the Government had allowed him to escape to avoid him becoming a martyr). In March 1689, aided by King Louis XIV of France, James VII invaded Ireland intent on reclaiming his throne. In support of cause James Graham, Viscount Dundee marched to Law Hill in Dundee with fifty men and raised King James' standard in Scotland. The first Jacobite rebellion had begun but initially few were keen to join the cause. The Catholic Clans were prompted into action however when King William ordered Major-General Hugh Mackay of Scourie to intercept and destroy Graham's fledgling force. Catholic Highlanders now rallied to his banner and 300 Irish troops arrived at Kintyre. Several months of military manoeuvres around northern Scotland followed as the two forces augmented their manpower and attempted to bring the other to battle on favourable terms. By late July 1689, Graham had mustered his army at Blair Castle. This key outpost occupied the main route north through the Cairngorms from Perth to Inverness. It was clear to Graham that the Government force would want to capture it to secure the lines of communication with Perth and, to do so, they would have to transit the Pass of Killiecrankie - terrain perfect for use of his men's forte, the Highland charge. Mackay made his way north towards Blair via Dunkeld broadly following the line of the modern A9. Graham now sent his men on a circular march from Blair Castle to occupy the lower slopes of Creag Eallich, the mountain immediately to the north of the pass. He sent his cavalry force directly towards the Government troops which, when spotted by Mackay, were assumed to be northing more than a skirmish force for the Jacobite army. On the morning of 27 July 1689 the Government troops pursued them through the Pass of Killiecrankie - a narrow, two mile track running alongside the fast flowing waters of the River Garry and enclosed on both sides by steep mountains. The Government army consisted of Dutch, English and (lowland) Scottish troops. Most were regular infantry troops in established Regiments armed with the musket and plug-bayonet. The soldiers were drilled to fire collectively in volleys to defuse and defeat a charging enemy. When hand-to-hand combat was inevitable, they would fit the plug bayonet, a relatively new invention (used for the first time in a British battle at Killiecrankie), which was slotted in the barrel of the musket. This enabled all the troops to carry muskets, rather than the traditional mix of musketeers and pikemen, greatly increasing the unit's firepower. The disadvantage was the troops could not fire with the bayonet in place and therefore only fiited it in the last moments before hand-to-hand combat ensued. The Jacobites lacked the uniformity - in equipment and clothing - of the governmental troops. Many carried muskets or pistols but the main weapon was either sword and shield or the two handed claymore broadsword. The main tactic of the army was the Highland charge. This involved a full speed advance to within 50 yards (45 metres) of the enemy line at which point muskets and pistols would be discharged with the aim of unnerving the enemy ranks. The Highlanders would then charge into hand-to-hand fighting with their traditional bladed weapons. The battle was fought to the west of the pass but the narrow road (now the B8079) prevented a swift retreat the way they had came. As Mackay's column advanced along the road, he became aware of the main Jacobite force on the high ground to his right (north). Too late he realised he had been caught in a trap. Retreat was impossible as the River Garry was to his back and any withdrawal back along the pass would have exposed them to a Jacobite assault against their disorganised ranks. Instead Mackay moved his men off the road, climbed the small hill to the right and deployed in battle array on a flat terrace. Mackay hoped this would provide a 'killing ground' where his men could destroy the enemy force with repeated volleys. To maximise his available fire-power, and to prevent any attempt to cut him off from potential retreat through the Killiecrankie Pass, he configured his entire force into one elongated line. To man this line he reduced his force to just three ranks deeps with the cavalry in reserve. Urrard House was occupied to act as his Command centre. 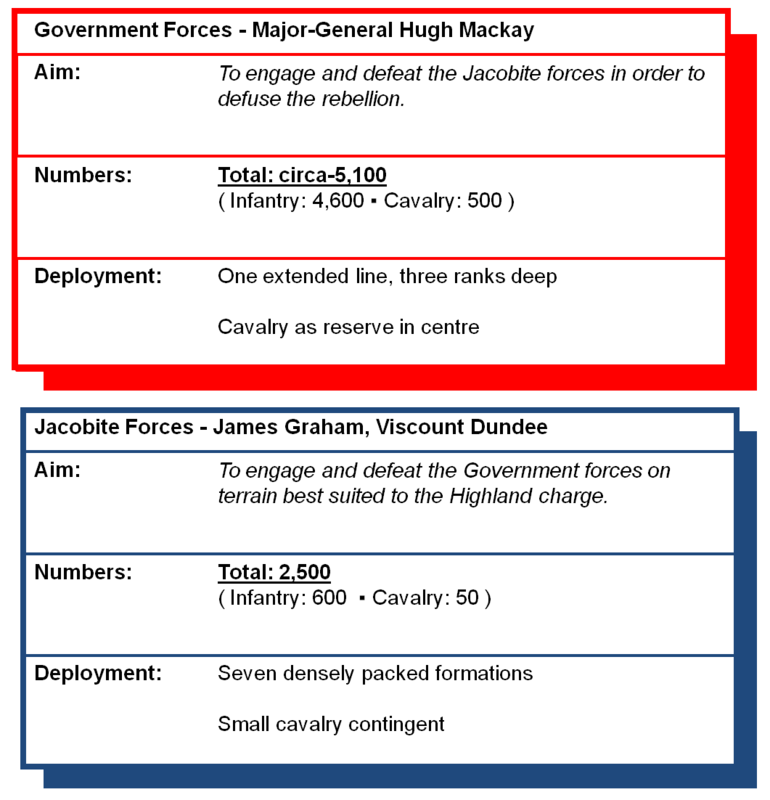 With the Jacobites occupying the high ground, Mackay had no option to initiate the battle himself. Meanwhile Graham was waiting until the sun set behind the high ground to the south to prevent a disadvantage to his troops. Throughout the afternoon little happened - the Government troops fired muskets and light canon shot into the Jacobite formations attempting to force action but the clans were restrained. To prevent excessive exposure of his men to the superior firepower of the Government troops, Graham configured his clans into seven densely packed columns each tasked with engaging a specific Regiment ahead of them. Around 8pm he ordered the charge. At around 80 yards (75 metres) the Government forces fired their first volley killing upwards of 600 Highlanders. At 50 yards the Jacobites fired their own volley, successfully unnerving the Government troops who failed to fire a second volley or fit their plug-bayonets in time. The Jacobites, having dropped their muskets, crashed into the Government line with their swords and axes decimating their opponents. With the Government ranks just three men deep, the Highland Charge successfully broke the Regiments on the left. Mackay ordered the cavalry to engage to stabilise the situation and led the charge himself but a counter charge by Dundee, along with the general panic caused by the fleeing infantry, meant his men did not follow. Amazingly Mackay hacked through the Jacobite lines ending up unscathed on the high ground with a good view of the destruction of his own army! Despite the chaos on the left of the battlefield, the Government right was broadly holding. A fighting withdrawal started back towards the Pass of Killiecrankie although the artillery had to be left once it was seized by the Jacobite cavalry under the Earl of Dunfermline. Graham himself led his cavalry against the remaining Government forces but was mortally wounded by musket shot from Mackay's Regiment. Nevertheless the Government ranks broke into total rout fleeing back through the Pass of Killiecrankie whilst being pursued by the Jacobites. The battle had been won by the Jacobites in less than thirty minutes. Government casualties were in excess of 1,200 whilst hundreds more were murdered in the subsequent pursuit. Mackay survived and arrived back in Stirling with the remnants of his army - now reduced to a mere 500 men. By contrast Jacobite casualties were around 1,000, most of whom had been killed in the initial Government volley, but they had also lost their inspirational and effective leader. The army returned to Blair Castle where Colonel Alexander Cannon, leader of the Irish Regiment, took command of the entire force. He then marched his army south, through the Pass of Killiecrankie, towards Perth where he attempted to take control of Dunkeld, However, the town had been strongly fortified by the Earl of Angus's Regiment and the Highlanders were repulsed with heavy casualties. After wintering in Lochaber, the rebellion was resumed in the New Year but was decisively defeated at the Battle of Cromdale on 1 May 1690. Two months later, on the 1 July 1690, James VII was defeated at the Battle of the Boyne after which he fled to France. Despite particular hostile opinions of the Highlanders, particularly from the Scottish Government, attempts were made to reconcile the northern clans with the regime of William and Mary. A general amnesty was offered on 27 August 1691 to any clans who had participated in the uprising provided they took an oath of allegiance to the new monarchs. This reconciliation was severely undermined by the massacre of Glencoe in February 1692. Both this and subsequent political changes - including the Act of Settlement (1701), which formally barred any Catholics from the throne, and the merger of the English and Scottish Governments by the Act of Union (1707) - meant three further Jacobite rebellions would follow in 1715, 1719 and 1745. Ultimately all were defeated and, with the construction of a military road network, life in the Highlands was transformed forever. Battlefield Trust. Battlefields Trust: Killiecrankie Battlefield Report. Lancaster, J.H.D (2015). Killiecrankie: Battlefield visit notes and observations. CastlesFortsBattles.co.uk. Ordnance Survey (2015). Perth and Kinross. 1:1250. Southampton. The visitor centre offers a good introduction to the battle. There is an easy walk from there to the Soldier’s Leap plus a longer one along the Pass of Killiecrankie. The latter follows the line of advance and retreat of Mackay’s army. The battlefield itself is displaced from the NTS property but you can follow via the footpath detailed below. A small monument/cairn has been positioned on the terrace on which the battle was fought (and allegedly was also the burial site for Officers killed in the battle). Unfortunately the A9 runs directly over the battlefield. Battlefield Cairn. The battlefield cairn is located on the terrace on which the battle was fought in vicinity of the Government left flank. It allegedly sits on the site of the mass grave of the Officers killed in the battle. Pass of Killiecrankie. Mackay advanced along the narrow road adjacent to the River Garry (on the left on this photograph). Once through the pass, this road was a bottleneck that prevented him retreating from the Jacobite army who had occupied a dominant position just beyond the pass. Soldier's Leap. 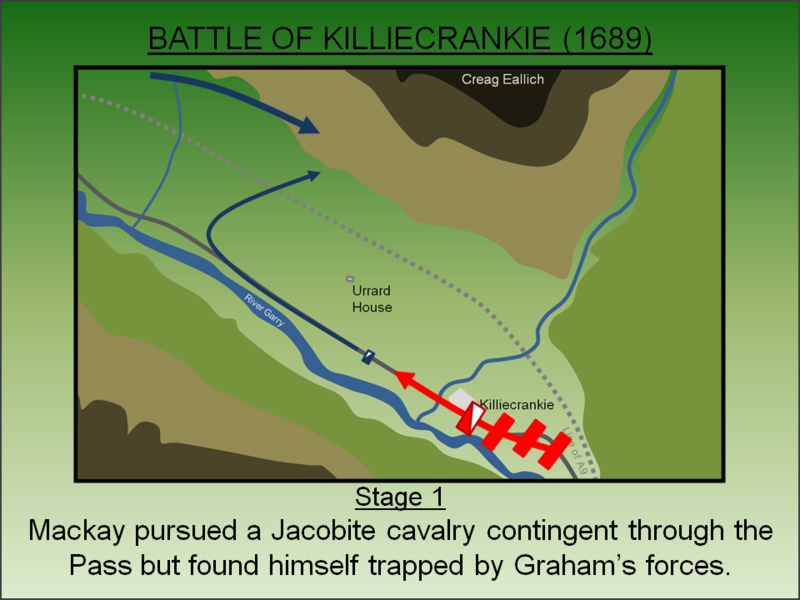 As the Government forces broke into rout, the Jacobites pursued them back towards the Pass of Killiecrankie. One of the Government soldiers, Donald McBane, evaded his pursuers by leaping 5.5 metres (18 feet) over the fast flowing River Garry. Claverhouse Stone. This is said to mark the spot on the battlefield where John Graham, Viscount Dundee was killed whilst engaging the retreating Government forces. In actual fact it is a prehistoric standing stone. The stone is visible in a field adjacent to the B8079 but is not included on the footpath to the battlefield. If you want to view it on foot, take care as there are no footpaths. A9. Regrettably the A9 now runs across the plateau on which the battle was fought preventing the visitor from fully exploring the area. Terrain. This photo is looking towards the battlefield. The mountain on the right is Creag Eallich and the Jacobites occupied its lower slopes.The Government army was advancing along the main road, hidden by the lowest treeline in the picture. They then ascended to a terrace overlooking the road. The visitor centre is found off the B8079 in Killiecrankie. Both are sign-posted and there is ample (pay and display) parking at the site. The footpath to the battlefield cairn is less obvious - follow the instructions below. Keep going straight on until you are in vicinity of the A9 and you will then start to see a few green signs pointing you left towards the cairn. The footpath runs broadly parallel with the main road. Strong footwear is recommended - when we visited in March 2016 there were a few spots of shin-deep mud.